The Q "Quiet" stainless muffler is the most aggressive, deepest sounding, highest performing backwater muffler built today.. 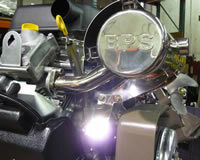 They are ideal when dynamic sound, torque, and horsepower improvements are demanded by out customers. Their maximum performance and improved flow path will generate more torque and power than ever before! If you really want to move larger boats and loads faster, then these Q mufflers are for you.